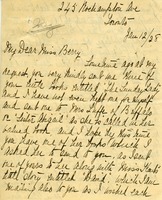 Berry asks Bonner to send fifty stories of the Berry Schools, fifty Sunday Lady pamphlets and good pictures for the newspaper to the Hotel Vendome. 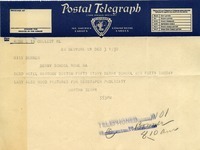 Edith B. Tessenden sends a small check with her prayers and 2 stamps and asks that the Schools send her some literature about The Berry Schools. 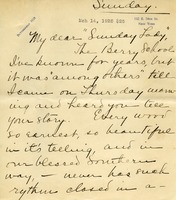 Martha Berry writes to Frank Babbott telling him they are sending him information about the Berry Schools, including a pamphlet called "The Sunday Lady," and how they are in need of money and donations to help the students. 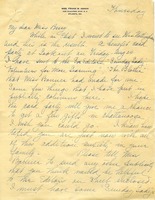 She hopes that he will help and notes that any gift is appreciated. 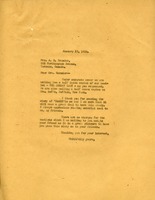 Mrs. Todd writes to express her deep interest in the Berry schools after hearing Miss Berry speak and to donate a gold coin to her good work. Mrs. Fishes thanks Miss Berry for the cotton she sent as a Christmas gift. She also asks for four copies of the Sunday Lady so she may give them to her friends. 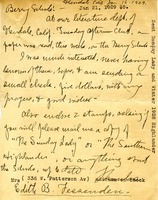 Martha writes to Mrs. Brander that they will send a half dozen copies of The Sunday lady. 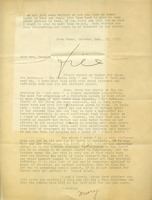 She also writes to thank Mrs. Brander for the copy of the story that was sent. Bartholomew is planning a special issue of the Three Arts Club magazine, The Foreward, that focuses on the Berry Schools. 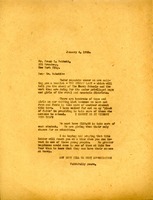 She asks permission to use a condensed version of "The Sunday Lady" and requests a photograph of Mrs. Robinson driving an ox cart. She suggests that since her acquaintances are not wealthy, and thus among those the Pilgrims are expected to invite to the upcoming dinner, she might be given a list of Atlantans to invite.